Food4Macc Direct's milk supplier Dennis Newton invited members to visit his farm on Sunday afternoon. 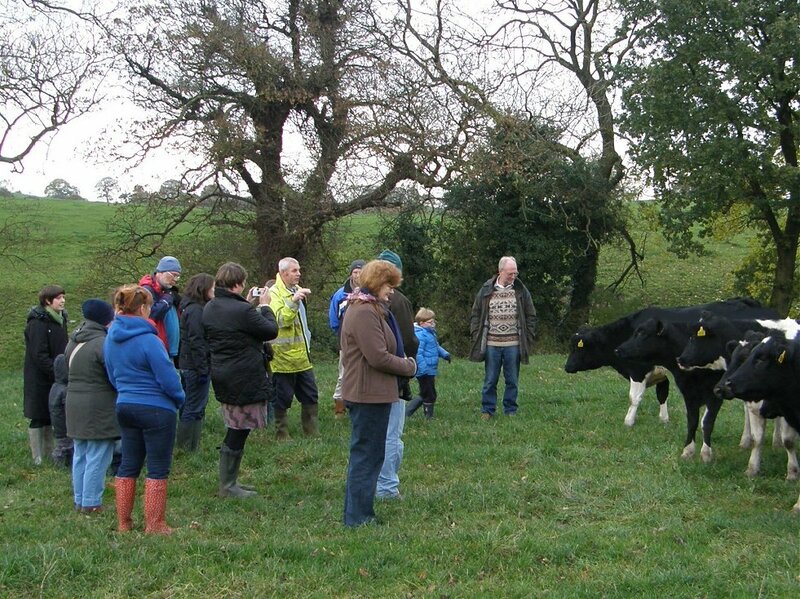 First we were introduced to the next generation heifer calves which in a couple of months will be big enough for their first pregnancy. 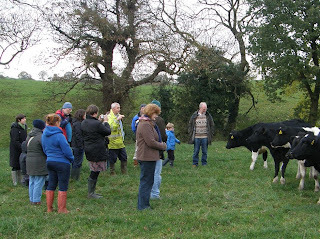 Then we returned to the yard where at this time of year the 40 or so milking cows spend most of their day, now that the ground has become soft with the rain, and grass is no longer so nutritious. 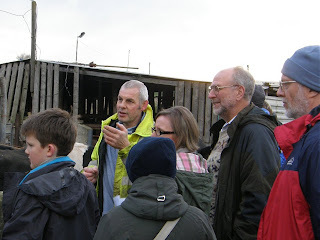 Instead they are fed on silage, and Dennis pointed out the light coloured strata of wheat that could be seen in the cut edge of the silage heap. The wheat is added to improve the nutritional value of the silage. 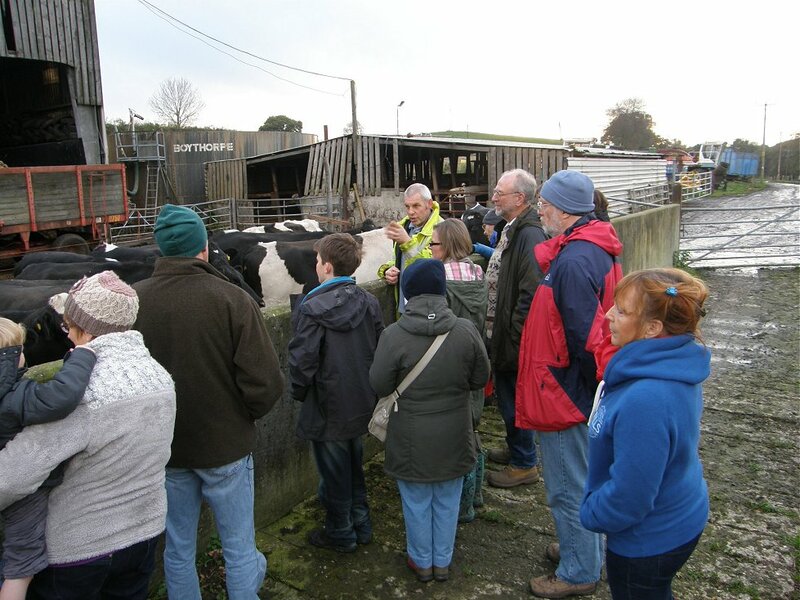 The visitors also heard about the difficult economics of milk production today, and how Dennis was only able to make it viable by selling directly to the public, rather than to the big dairies and supermarkets. The bull kept a close eye the visitors, appearing wherever we went. After a visit to some of the other pastures and an explanation of the grazing regime, we returned to see the milking parlour, where Dennis demonstrated how the cups are attached to the cows udder, and the safety precautions in place to ensure the milk was clean and the cows udders kept healthy. 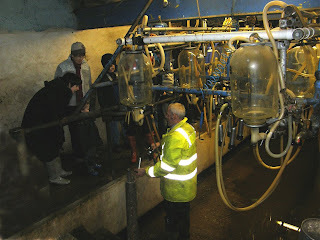 The cows are milked twice a day, seven days a week. 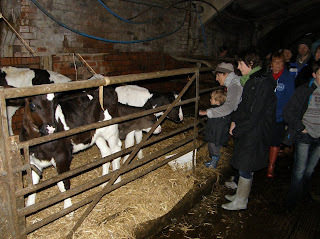 We also saw several calves. The females are kept for future milking, and the males are sold on. Most dairy farms sell their milk to big dairies or supermarkets, so Newton's farm is unusual in having its own pasteurising and bottling plant. Pasteurisation involves flash heating the milk to 72 deg C for just over 20 seconds - enough time to kill any bacteria without altering the flavour. If you would like to try Local Milk from Newtons, you can buy it from Food4Macc Direct in pint bottles or 2 litre plastic containers. 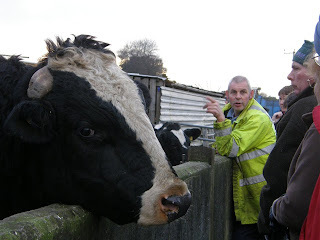 Alternatively, give Newtons a call on 01625 423987. You may be on one of their doorstep delivery rounds.